"As stated in Brahma-samhita (5.43), all the Vaikuntha planets in the spiritual sky (known as Vishnuloka) are situated in the planet known as Krishnaloka, Goloka Vrindavana. In that supreme planet the Lord enjoys His transcendental bliss in multiple forms, and all the opulences of the Vaikunthas are fully displayed in that one planet. 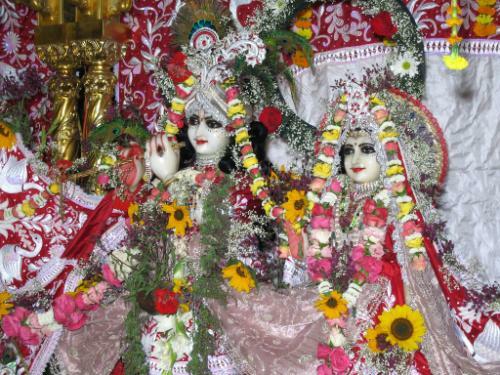 The associates of Krishna are also full with six opulences. In the Padmottara-khanda (225.57) it is stated that the material energy and the spiritual energy are separated by water known as the Viraja River. That river flows from the perspiration of the first purusha incarnation. On one bank of the Viraja is the eternal nature, unlimited and all-blissful, called the spiritual sky, and this is the spiritual kingdom, or the kingdom of God. The spiritual planets are called Vaikunthas because there is no lamentation or fear there; everything is eternal."